You need to move the Coin from the S(tart) cell to the END cell. From S you can move to cells 2,7 or 8. From BLUE cells you can only move ONE space diagonally. From YELLOW cells you can only move ONE space horizontally or vertically. 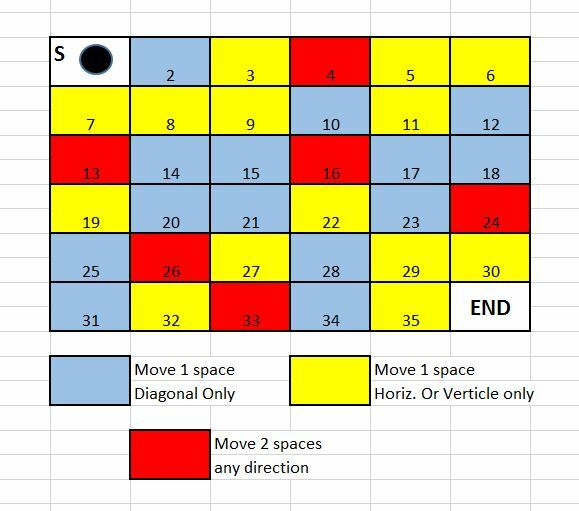 From RED cells you can move in any direction BUT you must move exactly TWO spaces, both of which must be horizontal, vertical, or diagonal. (For example, from 13 you could move to S, 3, 25, 27,15. ).The cell you jumped over is NOT considered as visited cell. Of course you cannot move out of the grid—haha! I hope this type of puzzle is not already covered. If it is, I apologize. Ah, I see someone else got there first. Interesting that we got different solutions - so there's at least 2! One thing that was useful was a bit of accounting. 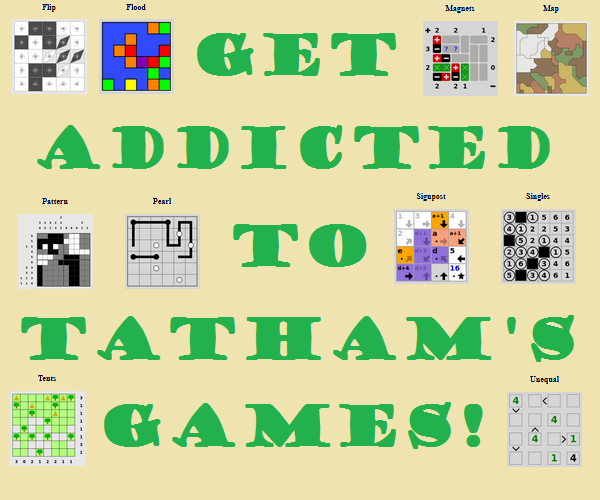 Imagine overlaying the grid onto a black and white checkerboard, with the start and end white. Then there are 7 blues on black, 7 blues on white, 4 reds on black, 2 reds on white, 7 yellows on black and 7 yellows on white. 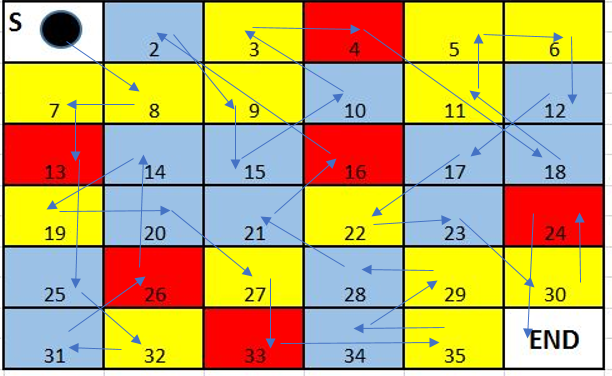 Now note that blues and reds always move to the same color and yellows always change color, and that we need to leave each of these squares exactly once. Therefore the total number of black squares we will move on to is 18 (7+4+7) and the total number of white squares we will move on to is 16 (7+2+7). Now we know that we need to move onto a total of 17 white squares and 18 black squares, and the only square we haven't counted is the starting square. So we need to start by moving on to a white square, which means that 1 -> 8 is the only possible first move. I opted to brute force it. There appear to be 9628 solutions. Code and solutions over here. The puzzle itself presents a directed graph and then asks you to find a path that hits all nodes once and only once, starting and ending at specific nodes. This is essentially the Traveling Salesman Problem. In the general case this is known to be a NP-hard problem (i.e. : there isn't much in the way of shortcuts). I imagine a similar puzzle designed around the arrangement and discovery of "artifacts" (like 1->8 and 31->26) would make for a puzzle where brute forcing is less desirable. Doing all of this feels like code golf but you're optimizing for speed rather than size. There's probably more optimizations that could be made but, by then, it was fast enough that I'd gotten an answer before I'd figured out the next optimization. Even so, it still took 15-20 minutes to run and about an hour to code. Start with corners obviously, these are most restricted. 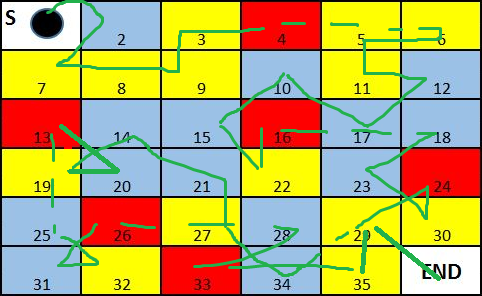 Bottom left corner works: 25->32->33->31->26, you cannot reach 32 and continue any other way. EDIT: Given one solution (maybe not the only one), I found out I forgot about 24->34 possibility. The upper corner thingy works, rest is maybe a possibility but not a certainty. 23->30->29->35->34->27 is the only way to reach 34 with the former 5 numbers blocked. 5->6->12->17->24->END is now the only remaining way to reach number 6 and end. I will continue later to see how far I can go without any guessing or assumptions.